Koei Tecmo announced another addition to the upcoming fighter Dead or Alive 6, and that’s “The Regeneration of Brutality” known as Raidou. 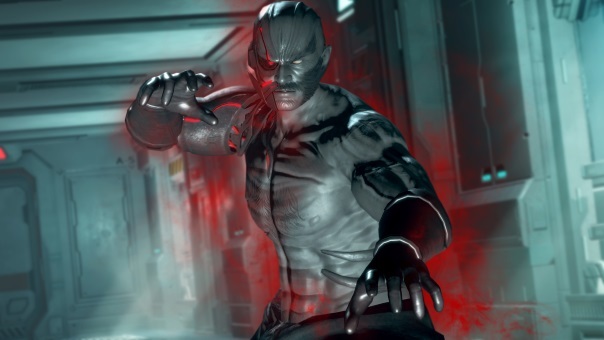 The sinister ninja was thought to be killed during the last Dead or Alive tournament, but as it turns out, he was recovered and experimented on using DOATEC’s biotechnology. While he’s now mindless, he’s still very much a killing machine. He still has Mugen Tenshin Ninjutsu to wield, though he favors a more power-focused fighting style. His physique allows him to slam opponents around with impunity, and he can also mimic attacks from others. In addition, two new modes were also detailed for the first time: Quest and Training. In the extremely addictive DOA Quest, gamers will need to clear various missions during matches to complete each individual quest. Clearing missions will be awarded Player Points and the unlocking of various cosmetic items. DOA Quest missions are designed for players to learn and memorize the various fighting systems and techniques, improving fighting ability while moving through the increasingly difficult set of challenges. After learning the ropes in Quest mode, fighters can then further their DOA education in Training mode. Here, gamers will be able to learn every aspect of the DEAD OR ALIVEfighting system through the use of Free Training, Tutorial, and the more personal Command Training and Combo Challenge.